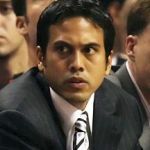 Miami Heat Filipino-American coach Erik Spoelstra may not realize it, but many from this basketball-loving nation of his mother’s birth are praying for his team’s victory in their best-of-seven NBA title showdown with the Dallas Mavericks starting Tuesday (Wednesday in Manila). Out of the some 50 respondents polled by this writer as to who between the Heat and the Mavs will emerge winner, 15 or roughly 30 percent, picked Miami simply because of Spoelstra being the man calling the hosts on the bench. Local basketball’s ‘living legend’ Robert “Bobby” Jaworski led all believers that the Heat should win if only to project to the world that in sports, the Philippines and the Filipino are force to reckon with like boxing’s pound-for-pound best Manny Pacquiao. “I hope they (Heat) win because of their Fil-Am coach, who, when we met for the first time, exuded humility,” Jaworski, a many-time national player during his amateur days and a long-time playing coach of the popular Ginebra San Miguel in the pro-league PBA, said. “Humility, you see, is one of the better traits any human being must possess, “ Jaworski, a former member of the Philippine Senate, who guided an all-PBA national team to a silver medal in the 1990 Asian Games, the highest for the country since losing the Asiad crown in 1966, stressed. “The only reason I choose Miami is because of coach Spo, who I had a chance to have dinner when he visited Manila. He is a Filipino, who more than proved to be one. So, its rather personal than technical,” Vargas, who now heads water firm Maynilad and a descendant of former Philippine Amateur athletic Federation pillar Jorge Vargas, said. PBA Governor JB Baylon, who represents multi-national Coca Cola Bottling International in the board, on the other hand said, his mind is for Dallas, but his heart is for Miami, likewise, because of Spoelstra, the first Filipino and Asian, for that matter, to coach in the world’s premier pro-basketball league whose mother Elisa (nee Celino) hails from San Pablo City in Laguna. Serbian mentor Rajko Toroman, who is handling the Philippine team to this year’s FIBA-Asia Olympic qualifying tournament, wants the Heat to regain the crown they last wore in 2006. He added though that the best-of-seen title series is evenly matched with no one enjoying a clear advantage over the other. Philippine Sports Commission chair Richie Garcia, Bacolod City Mayor Bing Leonardia, PBA Press Corps president Tito Talao, Philippine Olympian Association head Art Macapagal, former RFM Corp. team manager Elmer Yanga, U.S. –based former Toyota mainstay Abe King, and four-time PBA MVP Alvin Paxtrimonio have also expressed their preference for Miami to bring home the bacon mainly because of Spoelstra’s presence on the bench. Leonardia believes the Heat’s LeBron James, Dwayne Wade and Chris Bosh are “three-headed monsters” that a Dirk Nowitzki alone cannot handle, while Talao, who writes for Tempo, thinks Miami’s firepower provided by the “Big Three” under the Pat Riley-Erik Spoelstra tandem can prove a formidable advantage. “For Coach Spoelstra, the first Filipino to coach an NBA team and become, too, the first to romp off with a championship would certainly make us all Filipino proud,” King, known as the ‘chairman of the board’ during his playing days because of his rebounding prowess, said. Also putting their money on Spo and the Heat are Meralco team manager Virgil Villavicenio, Meralco assistant coach Boyet Fernandez, basketball guru Nemy Villegas and national tennis coach Randy Villanueva.